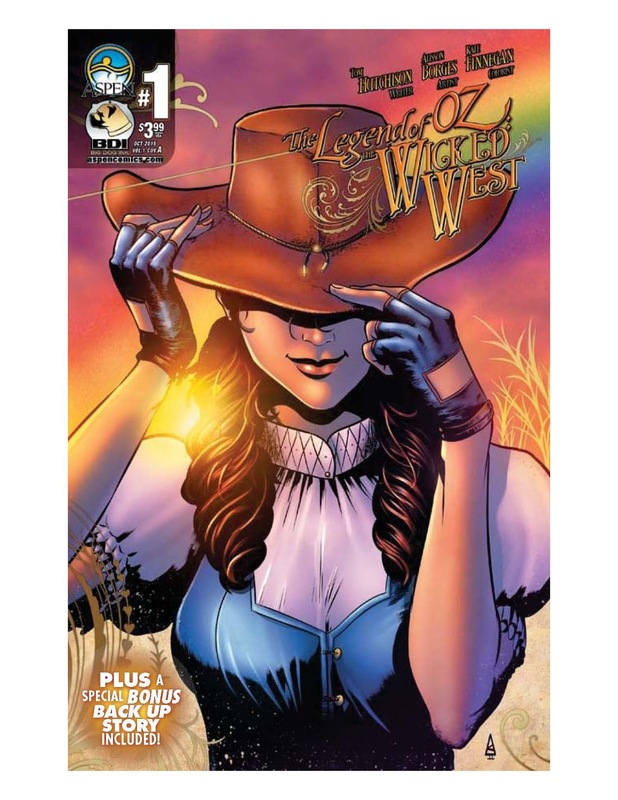 The Fellowship was fortunate enough to obtain a copy of THE LEGEND OF OZ: THE WICKED WEST #1 from Aspen Comics and Big Dog Ink. Tom Hutchison writes, Alisson Borges draws and Kate Finnegan colors. Dorothy and her horse Toto have been riding for days, trying to follow a road paved with gold bricks. The hard part is that the bricks have been stolen – no big shock – and the road is pretty much gone. She finds a town and confirms that she’s on the right path, but the locals don’t prove friendly. They seem concerned by her ruby pistols, and rightly so. And Gale, as she introduces herself, meets a few new friends here. This translation of the Oz story into a western works surprisingly well, and I’m not really a fan of westerns. But the “pistols and spurs” thing is kind of cool, and the backstory they hint at (of the witches) is compellingly told. Each character is different from Baum’s story, but it all makes sense in this setting. And the art is just beautiful, with Aspen’s usual high quality inks and stunning color choices. This really is more a translation than a normal retelling, and I’m excited about embracing the changes and seeing how they get to the Emerald City. THE LEGEND OF OZ: THE WICKED WEST #1 is available now at your FLCS or at aspencomics.com.